HSBC has partnered with Preservica to protect and future-proof digital assets of unique strategic and brand importance. HSBC is one of the largest financial services organisations in the world. 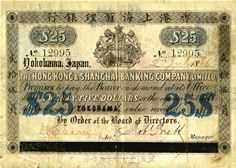 Founded in 1865 in Hong Kong to finance trade between Europe and Asia, the bank now serves around 38 million customers in 67 countries around the world. HSBC Archives contains the social, economic and political history of the communities and countries where HSBC has done business within its archives – including letters, photographs, cartoons, films, advertising and interviews with staff; all invaluable assets to HSBC. Far from being forgotten relics, the archives bring significant value and credibility to the HSBC brand. In 2015, when the bank celebrated its 150th anniversary, it drew on the resources of the archive for inspiration to produce a series of new videos for the HSBC Now YouTube channel as well as a limited run anniversary bank note. The marketing department also organised large-scale customer and employee events to reconnect its brand values to the story of its continuing business success. The positive role of the archives during the anniversary has led to growing demand and opportunities for the physical and digital assets. A raft of compliance requirements also had to be considered and catered to, as well as high level principles around collecting, embargos and access, which had to be approved by the bank’s chief legal officer. Risk, Legal and Compliance, IT and Records Management departments all needed to be in alignment before the project could go ahead. HSBC’s digital assets currently stored in Preservica’s active digital preservation platform number more than 102,000 individual items. These include core decision-making and corporate born digital materials from the working life of the bank, such as executive committee minutes, strategy presentations, research documents and internal communications as well as unique digital brand assets. The number of digital assets stored by HSBC is rising all the time. In the past six months the archives team have added a further 15,000 items and this rapid growth will continue as new sources for digital collecting are identified. Digital copies of images, audio visual assets and oral history records have also been ingested and preserved. Among the audio-visual assets are the ‘Hong Kong Bank Video Brief’ tapes dating back to the 1980s. These forerunners to HSBC’s current TV platform offer a tantalising glimpse of life at the bank in decades past, as well as an important record of news events as documented and broadcast to staff at that time. Though implemented with a view to eventually extending access across the bank and beyond, archivists are currently the primary users of the software. The team are charged with not only preserving digital records, but also appraising and processing them, and delivering content and information to meet the constant stream of requests from users. This includes increasing the number of access points for ingest to the archives, and putting automated processes in place that will allow non-archivists to access, add to and engage with the digital materials as a resource. Preservica is changing the way organisations around the world protect and future-proof critical long-term digital information. Available on premise or in the cloud (SaaS), their award-winning active digital preservation software has been designed from the ground-up to tackle the unique challenges of ensuring digital information remains accessible and trustworthy over decades. It’s a proven solution that’s trusted by business, archives, libraries, museums and government organizations around the world – including the UK National Archives, the Met Office, Texas State Library and Archives, MoMA, Yale and HSBC – to name a few.